A new type of exceptionally powerful and long-lived cosmic explosion, powerful blasts of high energy gamma-rays, known as gamma-ray bursts, that lasts hours rather than the more common minute, may mean a new hypothesis; that they arise in the violent death throes of a supergiant star. The first example astronomers found was on December 25th, 2010, but it lacked a measurement of distance and so remained shrouded in mystery, with two competing ideas put forward for its origin. The first model suggested it was down to an asteroid, shredded by the gravity of a dense neutron star in our own galaxy, the second that it was a supernova in a galaxy 3.5 billion light years away, or in the more common language of astronomers at a redshift of 0.33. A new study finds several more examples of these unusual cosmic explosions and shows that the Christmas Day burst took place in a galaxy much further away than the two theories suggested. Armed with its location, they developed a new model to explain how it occurred. They suggest this kind of burst is caused by a supergiant, a star 20 times more massive than the sun, which evolves to become among the biggest and brightest stars in the universe with a radius of up to 1 billion miles - up to 1,000 times that of the sun. Artistic rendering of the stars creating gamma-ray bursts. 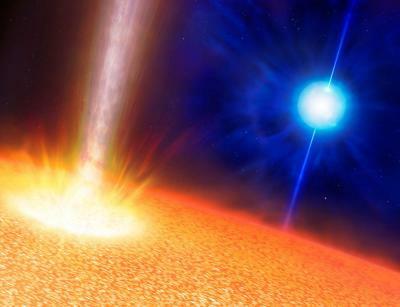 The background blue star is the progenitor of a standard long duration gamma-ray burst. A so-called Wolf-Rayet star, it has a mass ten or more times the mass of the sun but has a comparable size. The foreground star is the suggested progenitor of an ultra-long gamma-ray burst (GRB). It has a mass of perhaps 20 times the sun but is up to a thousand times larger. In both cases the GRB is produced by a jet punching through the star, but in the case of the ultra-long GRBs the much larger size of the star creates a much longer lived jet. Image copyright Mark A. Garlick, used with permission by the University of Warwick and distributed in their press release. Dr. Andrew Levan at the University of Warwick said, "These events are amongst the biggest explosions in nature, yet we're only just beginning to find them. It really shows us that the Universe is a much more violent and varied place than we'd imagined. Previously we've found lots of gamma-ray events with short durations, but in the past couple of years we've started to see the full picture." Nial Tanvir, a professor at the University of Leicester, and second author of the study added, "We believe that powering the explosion is a newly formed black hole in the heart of the star. Predicting the detailed behaviour of matter falling into a black hole in these circumstances turns out to be very difficult, and from a theoretical point of view we didn't initially expect explosions at all. The amazing thing is that nature seems to have found ways of blowing up a wide range of stars in the most dramatic and violent way." These jets are ejected extremely quickly (close to the speed of light), otherwise the material would fall into the black hole from which it can't escape. For this reason they last only a few seconds. However, a gamma-ray burst in a bigger star the size of a supergiant needs to power through a larger reservoir of material, hence its longer duration. Presented today at the GRB 2013 Symposium in Nashville, Tennessee.